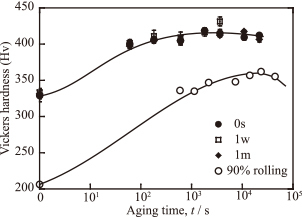 The microstructural change and aging behavior of Cu-1.8mass%Be-0.2mass%Co and Cu-3mass%Ti alloys severely deformed by high-pressure torsion (HPT) at room temperature were investigated on two-step aging condition; natural aging and subsequent artificial aging. Application of HPT processing under an applied pressure of 5 GPa for 10 revolutions at 1 rpm to the alloys produced ultra-fine grained structures. The hardnesses of the Cu-Be-Co and Cu-Ti alloys increased with equivalent strain up to 7, and then saturated to constant values of 400 and 330 Hv, respectively. Aging the HPT-processed alloys at 293 K gradually decreased the resistivities of the alloys; however, even after the longest natural aging period of 2.59 Ms (1 month), the hardnesses of the alloys remained essentially unchanged. The attained peak hardness of the Cu-Be-Co alloy on subsequent artificial aging at 593 K decreased with increasing natural aging time, while the age-hardening behavior of the Cu-Ti alloy during aging at 623 K was practically unaffected by natural aging at 293 K up to 2.59 Ms.